1955~1961 4,155 out of 4,185 mixed-race children were adopted to the U.S.
⇒ Most intercountry adoptions in the 1950s were mixed-race children adopted to the U.S. The Outbreak of the Korean War, The Establishment of Child Placement Service. As a national tragedy, the Korean War, which broke out on June 25th, 1950 and ended with a truce in July 1953, produced tens of thousands of war orphans including mixed-race children. Then, most children were sent to the U.S., with only a small minority sent to the UK or some Scandinavian countries. But it was merely a pursuit of measures for mixed-race children, and there were no regulations on foreigners' adoption of Korean children, causing difficulties in intercountry adoption of war orphans. Intercountry adoption in the 1950s was influenced not by domestic laws but by the enactment and revision of laws related to adoption in the U.S., such as the Displaced Persons Act and other laws related to orphans and immigration. In its early days, intercountry adoption started based on the article of 'fostering', which stipulated that 'children in welfare facilities can be placed in volunteering foster homes in accordance with certain procedures', in the 4th chapter of the regulation announced by the order of the Ministry of Health and Social Affairs in 1952. Therefore, the government proposed the Act on Special Cases Concerning Orphan Adoption on July 23rd, 1955,and laid the bill as many as 6 times from 1957 to 1961. However, the session of the National Assembly was not maintained, thereby leaving it as a pending issue. The adoption procedures of 12 adoptees who left Korea with Holt in 1955 were carried out through Child Placement Service (Holt Adoption Program began its own intercountry adoption procedures since June 1956, but Child Placement Service took charge before then). Harry Holt's departure with the children was recorded and aired on many TV and radio channels in the U.S.
Park Chung-hee, Chairman of the Supreme Council for National Reconstruction who seized power in a military coup d'etat in 1961, emphasized that Korean children must be brought up at home rather than in an orphanage, and developed a domestic adoption project and a long-term foster care project. Child Placement Service changed its Korean name in August 1961 (but kept its English name), launching a campaign, Foster One Orphan per Family, as an independent effort of Korea's child welfare projects, which in fact, had depended heavily on international aids. The effort, however, failed to produce satisfactory results because of its inherent vulnerabilities, such as an over emotional project development, and lack of a professional service system and lack of foster parents’ awareness. Due to these reasons, the long-term foster care project of Child Placement Service ended as a failure after a number of trials and errors. However, it created the momentum to revive the significance of foster care, later serving as a catalyst that would vitalize a temporary foster care project before adoption. Furthermore, the government enacted and revised adoption-related laws and policies that gave priority to domestic adoption, which in turn discouraged intercountry adoption. As a result, by the mid-1960s, the number of domestic adoption ended up exceeding intercountry adoptions. Baek Geun-chil, the second president of Child Placement Service, established Korea Social Service in 1964 and carried out consulting service, adoption service, and sponsorship projects for mixed-race children, war orphans, children from low-income families, children from broken families, and phsically- or mentally-challenged children in Korea. Korea Social Service developed a variety of services for child welfare by systematizing child welfare projects to provide healthy homes for children who did not have homes or could not be fostered by their parents. Then, there were many adverse effects coming from private adoptions, due to lack of organizations or policies responsible for intercountry adoption. In 1966, the government made it a rule to enable only authorized organizations to carry out intercountry adoptions. The government also introduced a number of laws related to child welfare, such as Law Concerning the Duties of Guardians for Orphans and Child Welfare Law. The International Social Services is an international organization with its headquarters located in Geneva, Switzerland, and it was authorized by the Korean government in 1957 to carry out activities related to intercountry adoption. There are three branches worldwide, and the Korean branch withdrew from Korea in 1967 due to operational problems, handing over all relevant duties to Child Placement Service. The ISS mostly took care of intercountry adoption, settlement of refugees, international marriages, family counseling, adoption problems, mediation and solutions. Intercountry adoption became diversified into Europe as well as the U.S.
Kim Deuk-hwang, the first president of Eastern Social Welfare Society, established a Christian Crusade in Korea in July 1971, and began adoption services with authorization of the government in 1972. He established Eastern Child Welfare Society in 1976, forming the current structure of Social Welfare Society, Holt Children's Services, Korea Social Service, and Eastern Child Welfare Society to start vigorous adoption services. In the 1970s to 1980s when people were confident that the economy had grown to a certain level and that they had overcame almost all the wounds from war, the number of intercounty adoptions rather rapidly increased. 7,275 children were adopted overseas in the 1960s, which soared by 6.6 times to 48,247 in the 1970s and by 8.9 times to 65,321 in the 1980s. As the success of the economic development plan that had started from 1962 achieved economic growth, aid from foreign private organizations gradually decreased. As intercountry adoption rapidly increased in the late 1960s, overseas Koreans and diplomats pointed out the problems with the intercountry adoption policy. Domestic opposition also arose regarding intercounty adoption, along with the international criticism from the U.S. and Europe, calling it 'orphan exports.' North Korea used this politically to reinforce false propaganda against South Korea, which led to the temporary suspension of adoption to Northern European countries. This served as a momentum for Korea’s adoption policy to put more emphasis on domestic adoption than intercountry adoption. The government enacted the Act on Special Cases Concerning Adoption in 1976 to correct the flaws of The Act on Special Cases Concerning Orphan Adoption and simplify the procedures for domestic and intercounty adoption of children accommodated in protective facilities, attempting to encourage domestic adoption rather than intercountry adoption. The government also imposed a duty on each intercounty adoption agency to fulfill a quota of domestic adoptions, and introduced a new system of allocating intercountry adoptions according to the number of domestic adoptions, as a way to encourage domestic adoption. The move was aimed at a complet banning on intercountry adoption by 1985, by increasing domestic adoption 10% annually while reducing intercountry adoption 10%, but to little avail. In 1985, the government established the 5-year plan of adoption and foster care for children with special needs, aiming to stop intercountry adoption. According to the plan, the government founded adoption and counseling agencies, which would carry out the duties of identifying, enlightening, counseling and encouraging prospective adoptive parents. However, ambiguous regulations on duties and standards of establishment, which adoption agencies must fulfill, and performance-oriented adoption projects, hiring amateurs, resulted in lack of professionalism, which in turn probably reinforced the public’s negative perception on adoption. In the 1980s, the government decided to fully open intercountry adoption to increase emmigration and activate people-to-people diplomacy, withdrawing the quota system and the intercountry adoption suspension plan that had been carried out to stimulate domestic adoption. With the opening of intercounty adoption, the number of children adopted to overseas homes rapidly increased, which led to competition among adoption agencies to secure the sufficient number of prospective adoptive children. However, not long after the announcement of full opening, the government gave an administrative instruction to refrain from carrying out intercountry adoption around the 1986 Seoul Asian Games and the 1988 Seoul Olympic Games, considering international attention to this issue. These measures by the government did not fully regulate international adoption, but were rather implemented occasionally when they might give a negative perception overseas. With the 1988 Seoul Olympic Games, many countries around the world started to show interest in Korea. In the meantime, the foreign press focused on the increasing number of children adopted overseas and the continued overseas adoption despite Korea's eye-opening economic growth and the hosting of the Olympic Games. They pointed out that Korea was "the world's top orphan exporter," criticizing that Korean children given up by single mothers made up 60% of foreign children sent to the U.S. in the form of adoption, the number of which exceeded 6,000 a year. Influenced by the foreign press, the media in Korea started to raise the issue of intercountry adoption, which increased social attention. Accordingly, the government decided to encourage domestic adoption by establishing the Adoption Project Improvement Guideline in June 1989. According to the guideline, the government intended to reduce intercountry adoption every year and eventually ban it with the exception of mixed-race children or disabled children by 1996. But this plan was withdrawn in 1995 due to lack of domestic adoption. Holy Family Child Adoption Center is an agency exclusively for domestic adoption established on May 11th, 1989, after the 24th Olympic Games in Seoul in 1988, as a project of the International Eucharistic Congress with the belief that Korean children must be raised by Korean. While the four previous adoption agencies were launched with the purpose of overseas adoption, this agency has great significance in that it was launched as an exclusive domestic adoption agency. In May 1995, the revised Act on Special Cases Concerning Adoption Promotion and Procedures was enacted by correcting the flaws in the Act on Special Cases Concerning Adoption. For instance, the revised law was aimed at eliminating obstacles to domestic adoption and making post-adoption services for intercountry adoption compulsory. The government also provided adoptive families with housing loans, medical expenses, educational costs, and living expenses. However, with the tradition of valuing blood ties and the reality of keeping adoption secret, the financial support for adoptive families did not act to vitalize domestic adoption. Consequently, with a new plan to accept intercountry adoption as an alternative for domestic adoption, the policy to stop intercounty adoption was withdrawn in August 1995. As Korea suffered a financial crisis in 1998 and was put under the supervision of IMF, children with special needs increased by 40% within a year, reaching 9,000 children. Most of them were from not only out-of-wedlock birth by single mothers but also broken homes and dysfunctional families. In the aftermath of the financial crisis, the number of children with special needs soared, resulting in a temporary suspension of the intercountry adoption quota system. Intercountry adoption that had started since the Korean War sent approximately 150,000 children for adoption (as of 2000, based on the statistics of the Ministry of Health and Welfare) to 14 countries, including the U.S., Europe, Canada and Australia. Moreover, with the national awareness of Korea's long history of intercountry adoption as well as the changing public opinion on domestic adoption, Mission to Promote Adoption in Korea was established by domestic adoptive families to promote and enhance domestic adoption and change the public perception on adoption. In July 1999, Adoption Information Center was established to provide integrated and professional post-adoption services for domestic and overseas adoptees. To establish a healthy adoption culture and promote domestic adoption, the Ministry of Health and Welfare designated May 11th as the National Adoption Day, indicating that one family (1) adopts one child (1) in the Family Month of May to become a new healthy family (1+1). The week starting from the National Adoption Day was designated as Adoption Week. The government and local organizations have been carrying out appropriate events, starting in 2006. 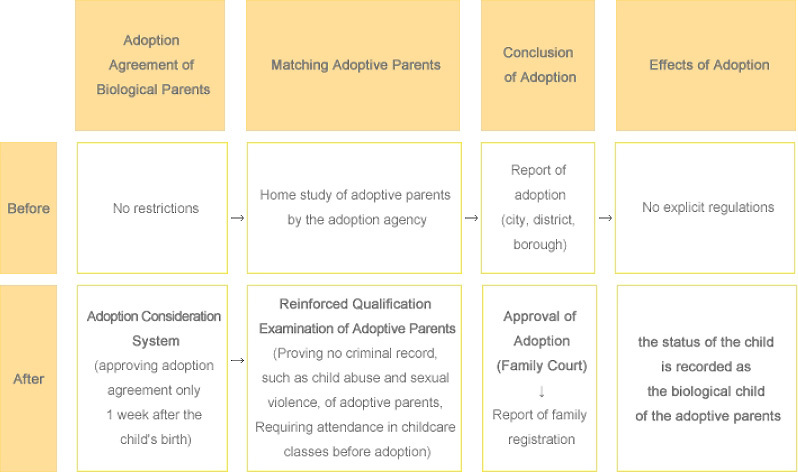 The government, adoption agencies and organizations are carrying out projects of adoption policy establishment, adoption survey and research, post-adoption management, adoption and family support, and education and promotion of adoption to encourage adoption of children with special needs and enable smooth adjustment of family life after adoption. They are also supporting the emotions of adoptive families by providing adoptive family gatherings, camps and contests, while also promoting adoption through broadcast, newspaper, internet and pamphlets. On May 24th, 2013, the Minister of Health and Welfare signed the Hague Adoption Convention in the Netherlands. The signing ceremony took place in the Netherlands Prime Minister's office (Binnenhof).